Mobile shelving systems provide maximum storage capacity solutions for challenging spaces. High-density movable storage systems can significantly increase storage capacity in a smaller footprint. High-density mobile storage systems offer both mechanical and powered systems to meet your operational needs. With a push-button aisle locking system and easy turning handle, movable storage shelving provides increased efficiency and unique customization options to handle any need. Easy to use and aesthetically pleasing, our mobile storage systems are a complete, professional high-density industrial storage solution. With a flexible design that can be configured to meet the exact needs of basically any facility, the durable, low-profile design allows for maximum space savings in storage areas featuring constraints such as low ceilings, obstructions or sprinkler systems. Our shelving systems are a favorite in various types of storage requirements. Business Systems and Consultants offers a wide range of shelves and shelving accessories for storage of tiny parts to bulky, heavy items that can be placed on mobile shelving carriages. From light duty profile to heavy duty industrial. What’s more, we’ve learned how to use the best storage and material handling solutions on the market to help you gain more storage space, optimize your floor space, and better organize your equipment, and supplies, all while remaining in the same facility. Use a series of mobile storage systems to accommodate a variety of different shelving units. Each of our models is a high-density mobile shelving system that can be configured with either electrical or mechanical assist. You can have yours designed for the unique applications and spaces in your building, but they’re all state-of-the-art regarding materials, durability, safety, and ease of use. 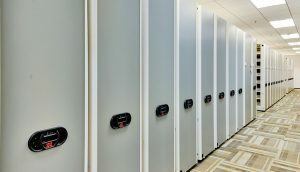 Furthermore, all the systems we carry or install can drastically increase your storage capabilities. They are space-savers that can actually give you up to three times more storage capability using the same facilities you have now. And thanks to easy-glide rails and mobile sections, you have fully movable shelving and can shift units as necessary to create wide-open aisles that allow you to access athletic equipment, supplies, or any other items you have stored on the shelves. BSC is a leader in high-density storage solutions, and we work with all the industry’s best manufacturers to bring you the most current and useful technologies and systems. It doesn’t matter what kind of organization you’re in charge of or what industry you’re in because you’re sure to find the right material handling and storage solution from BSC. Contact us today to discuss high-density shelving and storage options in more detail, or to request a quote if you’ve got a specific project in mind.